She took the long way home. She was a post surgical massage therapist. An esthetician. And a single mom for 12 years. But it was a childhood in Texas and her grandparents’ emphasis on respect, hard work and taking care of your own that finally put her behind the chair. She’s a straight razor ninja, equally at home behind the wheel AND behind the blade and a devotee of the old-school barbershop movement, where conversation, stories, laughter and camaraderie rule. She’s Brooke Dolan, owner of Brooke’s Two Bit Barbershop in Fort Collins, and now she’s on our team. Let’s meet her. Describe yourself in five words: Mother. Wife. Daughter. Barber. Badass. How did you get here? Success is a give and take. I try to give my customers not only great cuts, but a piece of myself. I try to bring them into our family and take their constant feedback and make myself and my team stronger. What are you known for? Prohibition era cuts and beard taming Colorado style, that’s more of a natural, comb and go beard that still has a clean lineup. The men I see in my shop enjoy a nice, crisp beard without the enhancements that you often see in pictures. Gib has the perfect example of a shorter Colorado style beard. What do you want us to know about you? I live for my clients. Without them there is no Brooke’s Two Bit Barbershop. Each day I try and outdo myself. I reach for tools and knowledge, which brought me to GIBS. Through training and sharing of knowledge we all get better and the industry grows. Favorite GIBS combo? Tree Hugger Vegan Beard Balm topped off with a bit of Alpha Male Beard, Hair and Tattoo Oil. Tree Hugger has an incredible hold that keeps even the most unruly beards tamed while the Alpha Male infuses the hair with even more moisture which is essential in our Colorado climate. The combination of the two products will give you the most incredibly soft and supple beard that everyone will want to touch! Tips for aspiring barbers/stylists coming up in the game? It’s easy to focus too closely on the trade and the tools and loose site of your connection with your clients. Find a balance. Your clients need you and you need them. Always be humble and kind. What’s it like being one of the women behind a rockstar men’s grooming brand? I feel incredibly fortunate to work with the GIBS team. Barbering has long been held back by its notion of gender roles and many talented women have gone unrecognized. GIBS knows no genders and believes in an atmosphere of knowledge, sharing and cooperation. What makes a great barber/stylist? A great barber is the person you trust. Whether it’s a job interview, proposing to your girlfriend or attending your grandpa’s funeral. You trust your barber to make you look your best and share in your life experiences. It’s not enough to cut hair, we are trusted friends, conspirators, psychologists, and a person that can be confided in. You do a lot of beards. What’s the secret to keeping a beard top notch? Maintenance. Guys will check their tires and change their oil on a perfect cycle. Yet they only let their barbers really take the time to tune up their beards every third visit. 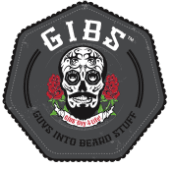 You have to get in there and fine tune it every visit....and of course use GIBS oils and balms everyday! You could have come out of a 1950s car magazine: I absolutely adore all things vintage, be it cars, knick knacks, belt buckles or clothes. In my spare time, I participate in period correct vintage car races with my lead foot on the gas pedal of my 1932 Ford 3 window coupe. I have a slight hoarding problem where it comes to antique straight razors thanks to my brother Kyle, who taught me how to straight shave before my journey into professional barbering. You’re driven by your family, too: My parents instilled in me a strong work ethic and the belief that one is never done learning and that you should always try to be better than you are today. I have two children I raised on my own until I married my husband in 2012. He supported me in going back to school to pursue by dreams. Follow Brooke on Instagram @twobitbarbershop.